Jenna Jones has written a big, sprawling story, filled with many characters lovingly remembered from two other sizeable books (Chiaroscuro and Something Beautiful). 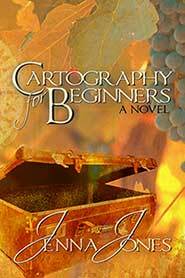 If you are coming fresh to Cartography for Beginners, a map may feel like a good idea. Stick with it, who loves whom, who loved whom back when, and who can’t stand whom now does come clear eventually. Leo Bellamy, who has been part of a committed couple (apparently he was a lot more committed than Adam was) for almost his entire adult life, is still grieving the relationship, yearning for Adam to come back. Everyone around him urges him to cut loose a little, kiss someone for giggles, something he’s really not ready to do. His few attempts fizzle out, because his heart isn’t in it, or because his heart is somewhere else and he hasn’t found it again. In his early fifties, Leo is convinced he’s beyond being found desirable by someone new. His buddy Stuart, whom he speaks to morning and evening, is willing to be a friend with benefits for a while, but has his own doubts about ever being able to sustain a relationship. Stuart’s track record is dismal, true, but he’s reached the point of sending the beautiful boys home untouched because they can’t make decent conversation afterward. If the story focused more completely on this couple, who wind their way through loss, grief, growth, and finding family and love once the bloom of youth is gone, it would be a complete and fine story, but that isn’t all that’s going on. Leo’s son Dune is finding his way again after a disaster one book ago, and is in love with the irrepressible Micah. Ben and Jamie have their own established couple troubles to work through, and “the Moms” (Frances and Ocean) are moving across the country, although Frances always has time to help Leo through his troubles. Approximately half the characters have slept with the other half at some point, which gives an unusual vibe to the story, but there don’t seem to be a lot of hard feelings, except toward Adam, the decamped lover, and toward Stuart, which seemed overblown in some cases. While Stuart and Leo were charming, especially in the way they helped and supported each other through some life traumas without being willing to admit to themselves or each other that they’d really found a love that could last, the secondary characters were a more mixed bag, ranging from Dune with his complicated feelings to the slyly bitter Joelle and the horrendous Emily. Where their stories appeared in a complete arc, they were more understandable, otherwise, the bits and pieces took a while to sort out. Ben in particular was very hard to like—whatever points he earned for the purity of his motives get taken away for the execution, and the only sympathetic female of Leo and Stuart’s generation was also gay. Adam in particular was a mystery—he was characterized as the sort of person that doesn’t stick a twenty-eight year relationship, raise a child and coach his soccer team (which he did), but more like the guy you dump once you realize what a sleazeball he is, about a month after you meet him.